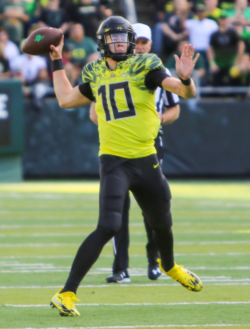 As soon as last April’s NFL draft ended, the draft prognosticators began whipping up their mock drafts for 2019, with Oregon’s own Justin Herbert being projected by many experts as a sure-fire first round pick, and even going as high as the number two pick overall. Hmmm … an Oregon quarterback getting drafted number two overall. Sounds familiar. In fact, it’s the same spot as a certain former Oregon all-time great who also just happened to play quarterback. So, naturally, this got me thinking. Thinking of something so preposterous, that it will surely raise the ire of many Duck fans, and maybe even so unholy that it’s viewed as committing a supreme act of sacrilege by others. 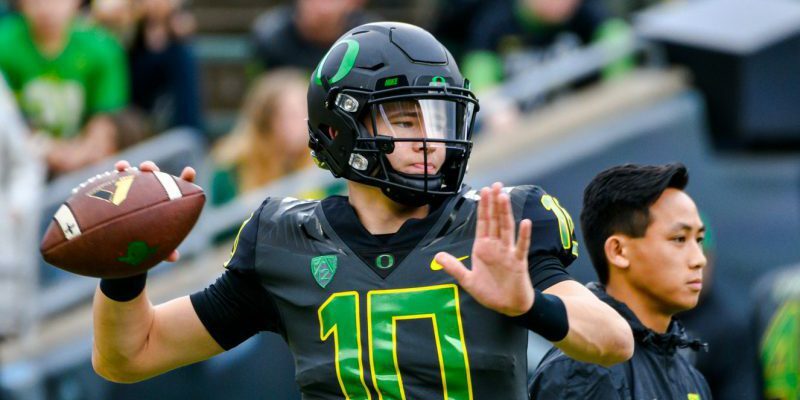 But, with Marcus Mariota coming off of what most considered a step backwards and down year – and yes, I can already hear you Mariota homers blaming it on ”bad coaching” – could Justin Herbert turn out to be the better NFL quarterback? It’s a damn fair question. I know, I know. How could I possibly even consider such a thing? Afterall, Marcus led the Ducks on their greatest run ever, is Oregon’s all-time best player, and — oh yeah — just happened to win the Heisman. And Herbert? He hasn’t even played a full season yet. But, before we get too carried away, let’s take a look at what the experts have to say. “The quarterback that has risen to the top of many draft boards early on in the draft process is Herbert. At 6-6, 225 pounds, he has the prototypical size that most teams love in their quarterback prospects. Equipped with a strong arm, good athleticism and a good sense of touch and anticipation, his potential is arguably the highest out of any signal-caller in the 2019 class. Justin Herbert is loaded with NFL potential. Some publications did not have Herbert on their draft board, as they believe he will come back for his senior season. I don’t see that happening. With his cannon of an arm and prototypical NFL size and skill, he’s gone if he has a good year in 2018. The 2019 quarterback class is not a strong one. A) Size: The protoypical size for an NFL QB. B) Arm: A strong “NFL” arm with top-end arm skills. C) One Cool Joe: Started his first game ever as a true freshman against the Pac-12’s best defense (notice how I coyly avoided mentioning “Huskies,” oh oops), and though he didn’t have a good game, he was not overwhelmed. Most would have melted in that situation. D) Intelligence: A top-notch student and a quick study of the Oregon offense, as he displayed in his very first game against that one team, and has continued to display through his two years. E) “It”: Seems to have the “it”factor, but needs to put together a complete season of getting “it” done. F) Mobility: Though not a “running quarterback,” he has the mobility to buy time and extend plays. 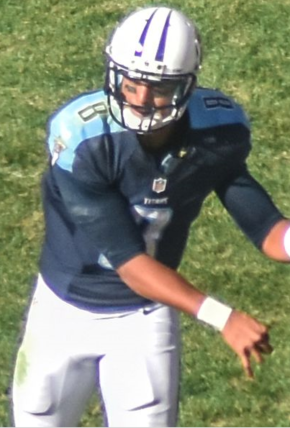 A) Injuries: Unfortunately, Mariota has missed his share of games so far in his young career. B) Turnovers: A problem he had at Oregon, in 2017 he threw 13 touchdowns vs. 15int’s. C) Overall Passing: A good passer but not as natural a thrower as Herbert. D) Running: Yes, he is a great runner, and much better than Herbert. 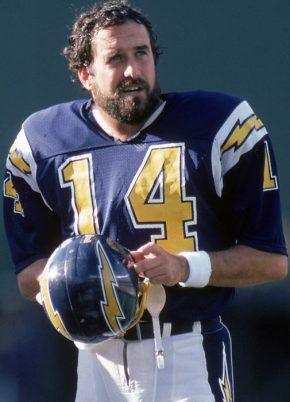 But great running quarterbacks tend to rely on their feet instead of their arm when they get in trouble. Though this isn’t a problem at the college level, it usually means that they have a bit of work to do on their passing mechanics when they get to the NFL. As the 2018 season unfolds, we should have a much better idea of what Herbert will be capable of doing at the next level. But, as of now, it seems Herbert definitely has a chance at making a splash in the NFL and being a better pro than Mariota. In 2018, Herbert could have a Heisman-esque season, a quarterback-desperate team could get the top pick, and good ole Herbie could go No. 1. Now that would be some crazy talk!